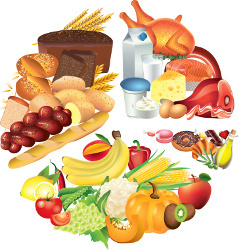 Ingredients: Beef broth, beef, wheat gluten, liver, meat by-products, modified corn starch, carrot, barley, wild rice, spinach, salt, soybean flour, potassium chloride, zinc sulfate, ferrous sulfate, copper sulfate, manganese sulfate, potassium iodide, sodium selenite, tricalcium phosphate, vitamin E supplement, niacin, thiamine mononitrate, calcium pantothenate, pyridoxine hydrochloride, vitamin B12 supplement, riboflavin supplement, vitamin A supplement, folic acid, vitamin D3, biotin, choline chloride. Beneful Prepared Meals Simmered Beef Entree is formulated to meet the nutritional levels established by the AAFCO Dog Food Nutrient Profiles for the maintenance of adult dogs. We'll begin this review of Beneful Prepared Meals Simmered Beef Entree with a detailed discussion of the ingredients. Because ingredients are listed in order of pre-cooked weight, the remaining ingredients in Beneful Prepared Meals Simmered Beef Entree are not as important as the first five ingredients. Then we have barley. Barley is a nutritious carbohydrate source, naturally rich in dietary fiber and various minerals. Unlike pearled barley, regular barley contains the entire grain. 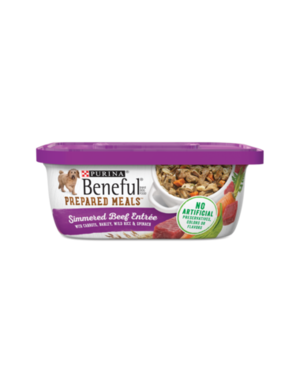 The official PawDiet rating for Beneful Prepared Meals Simmered Beef Entree is 2.5 out of 5.